Writing a grocery list is easy. Writing an effective grocery list is hard. An effective grocery list includes everything that I need, a couple of things that I want, and nothing else. It is organized by aisle and does not require me to double-back or, worse, to return to the store later in the week. 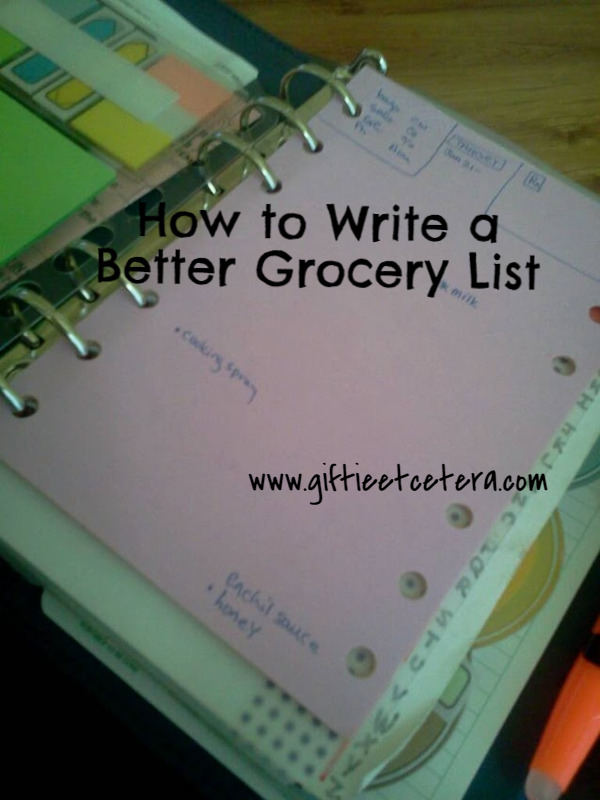 There are many tricks that I use to write a better grocery list. My grocery list goes in my planner right behind my sticky note dashboard. It needs to be very accessible, since items are so often added during the dinner cooking crazy hour. Having a dedicated space for a shopping list is so much better than sticky notes or torn slips of paper all over the house. My layout is pretty much the same for each week's shopping list. It reflects the layout of the store. Note that I fill my prescriptions while at the market. I have a eight item checklist for making a grocery list. Note that in a time pinch, I can skip all steps and just shop from my list. These items are only intended as a means to budget. 1. Bring usable bags to the store (saving the planets and earning a $0.05/bag discount at Target, where I usually shop). 3. Use a gift card if I have one. 4. Check my text messages for discounts. 5. Use Cartwheel (a Target discount app). 6. Cut coupons and make to grocery list. 7. Use a % off coupon if I have one (available at Target by signing up for pharmacy rewards). 8. Getting my husband's grocery list from him. A dot means I can wait for a sale or next week, but will need the item soon. A star means it is a must have item. These codes help me make decisions in the store about whether to buy today or when the price drops. I have extra things on the list, like special stores that I need to shop at or my prescription list. It helps me see overall what I am buying. I make a few exceptions, like stocking up on kids' gifts when they are on clearance for birthdays and holidays and occasionally buying a ribeye for the freezer when it is on clearance, but mostly, I just buy what is on the list. I buy eggs maybe three times a year - my Mister is bad about eating baked goods, so I end up eating most of it, and while it's delicious, not the best option, ha! I my grocery list in my financial section of my planner, and add sale and coupon prices to the list as well (and denote if a price is something I need a coupon for). Also, sale dates. So, if something is on sale this week, but it actually doesn't end for a month, I'll make a note of it, to reference for my next few lists. Great ideas!! I struggle with organization so keep inspiring us that need help. I love the dot and star technique. That totally makes sense to me and something I can really begin using right now. Thanks for linking up to Something to Talk About link party! !